I recently strolled down Grant Street in downtown Pittsburgh and was struck by two images. First, there was the stirring life-sized Nativity that each year is displayed on the property of the giant U.S. Steel building. It is an inspiring sight. The tents constituted Pittsburgh’s mini-version of Occupy Wall Street. It was “Occupy Pittsburgh.” Yes, right there at the core of the Steel City that literally won world wars and built America through capitalism. The two images—the Nativity vs. Occupy Pittsburgh—are a stark contrast. They were separated by maybe 100 feet of space, but by light years in worldview. The Nativity is the true symbol of Christmas, of course—an attempt to recapture the real meaning of the secularized season. The Occupy movement, on the other hand, is intensely secular, despite its small presence of “social justice” Christians. Both symbols, however, share one thing in common: they are testimonies to the excesses of the extreme Left. Consider first the Occupy movement: The Occupiers define themselves as against Wall Street specifically and big business and big banks and “corporate greed” generally. I don’t want emails from people telling me the Occupiers have a point here and there. Let’s not be fools. This is a self-professed, staunchly far-left movement rooted in anti-capitalism. Read their blogs, watch their interviews, look at their manifestos, stop by one of their outposts, read about their crimes and destruction of property—including (speaking of the Nativity) their smashing of a statue of Mary. Their message is unmistakable. I’m most troubled by certain elements of the Religious Left hooking up with the Occupiers. For 100 years, far-left atheists who despise religion, who have relentlessly mocked and persecuted Christians and people of all faiths, have successfully recruited the Religious Left to their rallies under the rubric of economic and social justice—like sheep led to the slaughter. Believe me, I research it, I write books about it. The Occupy movement’s ability to attract the Religious Left is just the latest example of a century of cynical and remarkable political exploitation. The folks at the Occupy protests in cities nationwide are the same who for decades have busily filed lawsuits to have Ten Commandments and crèche displays removed from courthouses. And that brings me back to that giant Nativity scene. The Pittsburgh Nativity is a powerful response to what happened in the city some 20 years ago. In 1989, the Supreme Court took the case of the County of Allegheny v. the ACLU, where it considered the constitutionality of a Nativity scene and Menorah that for years happily resided on public property at two adjacent county buildings. Pittsburghers embraced both symbols; after all, it was Christmas and Hanukkah. The ACLU, however, recoiled at the sight, and rushed ahead with a law suit. The court ruled on July 3, 1989, the day before Independence Day, when Americans commemorate the inalienable rights endowed to them and their nation by their Creator. It ruled that the Nativity violated the Constitution’s Establishment Clause. The court case is historic, if not infamous. Not as familiar is the corrective now sitting aside the U.S. Steel building. In 1999, 10 years after the court ruling, a group of inspired Christian leaders got together and erected the Pittsburgh Crèche, the world’s only authorized replica of the crèche in St. Peter’s Square in Rome, constructed from plans by Vatican architect Umberto Mezzana. It features truly larger-than-life renderings of the Holy Family. It sits gloriously at 600 Grant Street, a few hundred yards down the road from the county buildings where the ACLU fought a tiny little crèche. Baby Jesus rests on private property, where secularists can’t evict him. Ironically, the bad economy that has spurred Occupy Pittsburgh has taken a toll on the Pittsburgh Crèche. The endowment funding the crèche is dwindling fast, leaving the Pittsburgh Diocese with the task of raising a pile of money—money that, like the property protecting the crèche, must be provided by the private sector, not the government. Alas, there are two symbols positioned side-by-side in Pittsburgh, perhaps providentially. They represent two visions. One demands the abolition of capitalism; it is a sign of anger and despair. The other brings us goodness and light. If the Occupiers want hope, the answer isn’t in Washington or Wall Street but in the humble manger within their reach. They have a lot of time on their hands. I suggest a stroll down the street. Dr. Kendor. I’m with you 100% in your hatred for the militant secularization movement in the United States. But it began with a vengeance using the Warren Court as a battering ram to destroy Judeo-Christian culture. The Bible and prayer were stricken from public education in 1962-63, and it’s been all downhill ever since. However, to blame the young idealists who make up the bulk of the Occupy movement overlooks the fact that they were not born yet. Nor am I seeing OWS as being anti-property rights or anti-capitalism per se. There are a few Marxists here and there, but the main tendencies that I’m witnessing are anti corporate greed (i.e. mega and multinational corporations, not small business) and anti-plutocratic politics. As my young (conservative not liberal) pastor put it, OWS is against greed and is for the little guy. So are Catholics. Unless we disdain and disregard social justice doctrine. The creche is a depiction of the first occupiers. Along the vein of that thinking – darkness came into the world and the darkness (shone?) in the light but the light did not overcome it. Capitalism is not mentioned in the New Testament; it is not gospel. It is a means to an end – the ends being, the provision of suitable work for people and the just distribution of goods. It may not be the only means to these ends. I believe, with our society on the ropes as it is, we need to be thinking creatively about a system that will work better, be more just, and be more in keeping with God’s law. I definitely don’t think we Catholics should be going out of our way to save capitalism; unless by saving it we mean transforming it into something objectively better. “Here one could open up a vast and complex field of reflection on the theme of poverty and riches, also on a world scale, in which two logics of economics oppose each other: the logic of profit and that of the equal distribution of goods, which do not contradict each other if their relationship is well ordered. Catholic social doctrine has always supported that equitable distribution of goods is a priority. Naturally, profit is legitimate and, in just measure, necessary for economic development. In his Encyclical Centesimus Annus, John Paul II wrote: “The modern business economy has positive aspects. Its basis is human freedom exercised in many other fields” (n. 32). Yet, he adds that capitalism must not be considered as the only valid model of economic organization (cf. ibid., n. 35). Starvation and ecological emergencies stand to denounce, with increasing evidence, that the logic of profit, if it prevails, increases the disproportion between rich and poor and leads to a ruinous exploitation of the planet. Instead, when the logic of sharing and solidarity prevails, it is possible to correct the course and direct it towards an equitable, sustainable development. Dr. Kengor is not looking for a consensus on capitalism as the most equitable system. 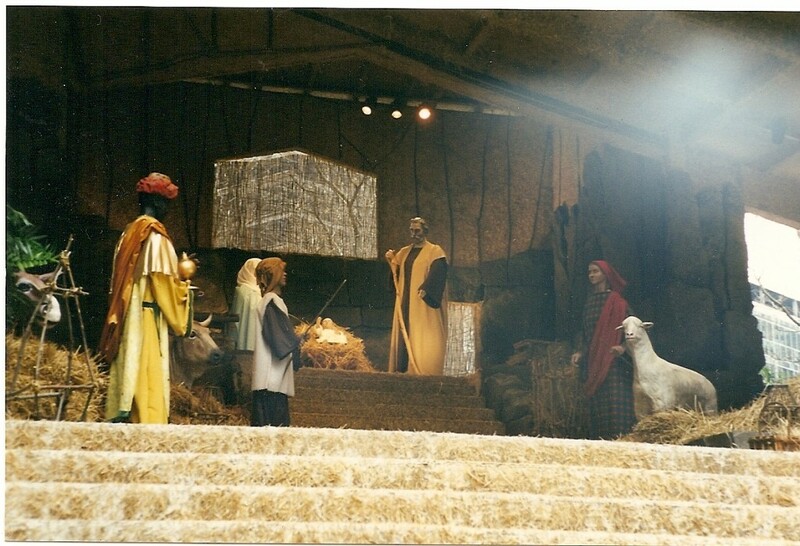 He is simply juxtaposing the display of the Nativity with the display of the Occupiers. One shows completely selfless love, humility and sacrifice to the extreme while the other is an immature display of envy, laziness, covetousness and a complete disregard for the legal property of others. One leads a soul into the light while the other into darkness.